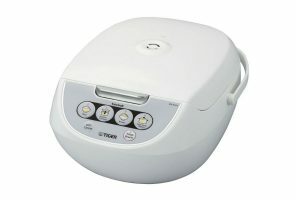 This Tiger Corporation JBV-A10U-W is a little more advanced than a simple press button rice cooker. It is white color with an easy carrying handle. It has four main menu cooking functions and two other extra buttons. So it has a total of six buttons for you to learn how it works if you decide to go with this model. Don’t worry, it is not that complicated to use. I have seen rice makers a lot more complicated than this. As a matter of fact this one is pretty simple to use. Those six functions are plain rice, brown rice, slow cook/steam, Syncro-cooking, keep warm, and ON/Off. Is There A Bigger One In Size And Where To Buy It? What Is The Rice Cooking Time For This Model? Does It Have A Timer And Retractable Cord? What Is The Power Watt, Weight, And Dimensions? Is The Inner Pot A Nonstick? Is It Dishwasher Safe For This Model? What Is In The Box and Where Is It Made? Yes, the Tiger brand made two available rice capacity sizes for this model to select from. One you can use it to cook up to 5.5 cups (1.0 Liter) of uncooked rice and the other one is 10 cups (1.8 Liter) of uncooked rice. I recommend to go with the smaller one if you have about two to three family members. If you have more family members go with the bigger one with the 10 cups rice capacity. You can buy the bigger one in size by clicking here. You might still be a little confused with those functions if you are a complete newbie buying a rice cooker even though the menu setting are self explanatory. Let me explain a little more in detail with those menu settings. Plain – This is the first button and this setting is referring to just cooking white rice, like my favorite Jasmine rice. If you are cooking plain rice then you would have to press this function for the setting. Syncro-cooking – This is the second button on the menu selection. This function is to cook rice and steam your favorite main dish at the same time. There is a limit of maximum and minimum cups of rice you can cook with this function. The minimum cup of rice you have to cook is 1 and the maximum is 2 cups for the 5.5 or 1.0 Liter. As for the 1.8 Liter or 10 cups, the minimum is 2 cups and maximum is 4 cups. Those measurements are in uncooked cups of rice. The cooking time for the 1.0 Liter is about 34 to 50 minutes and 40 to 59 minutes for the 1.8 Liter. You may also steam your dishes without having to cook the rice but not with this function. You would have to use the slow cook/steam function for this to work. You also need to remove the cooking plate when the rice is done cooking and then you can use the keep warm mode for the rice if you need to. The cooking or Tacook plate doesn’t have holes in the middle of the steam tray like the other does. It will not leak out any liquid or sauce to the rice from the bottom. In other words, without the holes it won’t affect the texture and flavor of your rice. The Tacook plate is designed for steaming and it is BPA free so you won’t have to worry about it being bad for your health from using it to steam your food. Brown – This is the third menu selection counting from left. This one is to use it to cook brown rice. Brown rice usually takes a longer time to cook and cooks a bit less than cooking white rice. You can use the slow cooking function to slow cook your food such as soup, beef stew, chicken, etc… I like using the slow cooker to cook fiesta chicken and barbecue beef. This cooker includes a cookbook, so if you are planning to cook some of the recipes, be sure to follow the instructions for tasty food. Off/Cancel – This function is pretty obvious. It is an OFF/Cancel button duh. LOL….. It is recommended that you press this button to turn it off and unplug the unit when it is not being used. Keep Warm – The cooker will automatically go to keep warm mode when the rice is done cooking. You can leave your cooked rice in keep warm mode for 12 hours. Do not leave it more than 12 hours. Doing so will cause odors, dry rice, discoloration, food rot, and it can damage the inner pot. The keep warm light will flash if it is used more than 12 hours. Note: Do not use the keep warm mode function to keep the rice warm while the cooking plate is in the rice maker. So if you are steaming and cooking the rice at the same time, you should take out the cooking plate after the rice is done from cooking and then use the keep warm function. Be very careful, the cooking plate is very hot. You should use mittens to protect you from getting hurt to take it out when it is done. Well, I know some of you might want to know how much time it needs for this cooker to finish cooking plain and brown rice. So I took some time and put it up for you to take a look to see if this gadget meets your cooking time expectations. Note: the time is only for the Plain and Brown rice menu settings. No, this unit doesn’t have a timer function and the cord is not retractable. If the timer function is very important to you, you would have to choose a different cooker. You might want to check out the Aroma ARC-150SB Rice Cooker. They have very similar cooking functions and it does have a delay timer function. It might also have a better price. The weight for the 5.5 cups is 5.7 pounds. It uses 672 Watts and the dimensions are 10.6″W x 13.9″D x 8.4″H. The 10 cups is 7.5 pounds. It uses 941 Watts and the dimensions are 11.9″W x 15.1″D x 10.0″H. 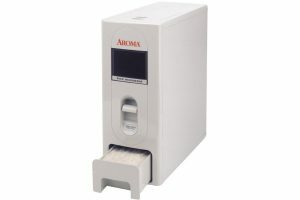 Both models use a 120 volt for power supply. Yes, this design has a nonstick inner pot for easy cleaning and the rice won’t burn or stick on the bottom. You can also use the inner pot to wash your uncooked rice as well. I do recommend using a rice container with drainers to wash the rice separately. It is to preserve the nonstick to last longer. 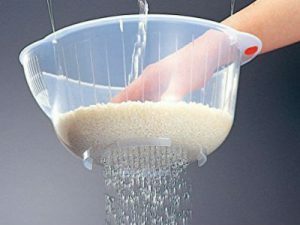 Click here to read more about the rice washing container. The answer for this model is a big fat NO according to the manual. You should hand wash all the parts and wash all the parts after each use for the inner pot, spatula, cooking plate, measuring cup, and pressure control cap. Please don’t use the inner pot to soak your dishes in it. Doing so will cause the nonstick to peel. The box comes with the below items and the unit is made in China. If you ever need to replace the inner pot or measuring cup, you can buy the part from “Tiger Spare Parts Store”. This model receives very high marks from consumers. Many are very happy with their purchases and are recommending it to others. 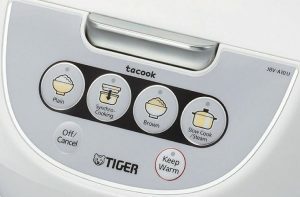 Well, you can expect it from a trusted Tiger brand for a rice cooker. Pros: The price is right. Perfect rice every time. No need to keep looking at the stove when cooking rice anymore. The slow cooking function is a plus. The rice doesn’t stick or burn at the bottom. Cons: Several are complaining about the lid for this model being hard to clean since it is not removable. The only thing you can do to clean it is to use a wet cloth to wipe it clean. A few are saying non stick from the inner pot is peeling off. This rice cooker has a one year limited warranty for defects. If you need to use this service, it requires your proof of purchase or receipt. So be sure to save your receipt. If you need a digital manual copy for this model, you can find it by clicking here. The user manual is written in three languages. It is in English, French and Chinese. The download size is about 10MB and it is PDF format. It requires adobe reader to open it.